and took him on a Journey! 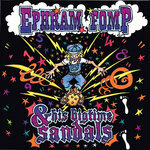 Ephram Fomp and His Big Time Sandals! One fine day as Ephram Fomp was out digging for Noopas in his yard (Oh he did have a taste for Noopas), he heard a strange sound coming from a nearby Hoofty bush. Ephram’s ears perked up and he went to investigate, but just then his mother called him in for dinner. Ephram scurried into the house for dinner and sat down at the big wooden table. His father waddled in with a sour wince. Just then a Zook fly landed on Ephram’s big toe, without even thinking the other big toe of the other foot reached over to swat it away. The next day as Ephram was out playing, he remembered the Hoofty bush. “Lets take a look,” Ephram said out loud. His big time feet swished and flopped on the ground as he walked. They looked very worn in and were made of tan leather with big straps held together by large metal hoops. Shiny gemstones of all kinds were stitched into the straps and sole of the sandals. Ephram looked around, saw nothing and heard only the sound of the wind. “Might as well try them on,” he said. And they fit almost perfectly. Suddenly Ephram felt very, very strange. It felt like the sandals were moving. They were! They wiggled Ephram’s feet and the straps on the sandals began to tighten down. And the gemstones seemed to be glowing. “Hey, hey! What’s a happenin?” Ephram hollered. He reached down to unbuckle the sandals but they wouldn’t budge. The sandals made his feet walk forward, in a direction he didn’t really want to go: away from his home and into the forest of the big, dark, Two-Tongued-Trees. Ephram couldn’t control where his feet were going. But the sandals kept taking him forward deeper and deeper into the woods. The hairs on his toes stood on end as his big time feet swished and flopped on the mossy forest floor. The hilltops grew with a rosy light as the shadows deepened in the forest. The stones on the sandals lit the way through the woods. The smells began to change to a scent of old ancient stuff like the way grammas’ house smelled. The Two-Tongued-Trees were bigger than Ephram ever remembered. Seeping butterworts and semi-ovate squashes hung from the trees, swaying lightly in the mysterious breeze. “Oh my,” Ephram sighed. By and by, and after awhile of miles of walking, Ephram began to hear a strange sound. From deep in the woods came a gurgling, “HA HA HA HAGH HAGHH. Ha aha gng agn.” It was a Vomus-worm laughing near the thicket of smile. “HA HHA HA HA HA HAGHH HAGGHH HA.” It seemed to be covered in a mucus-like slime, had many pink sections and was slightly larger than Ephram. It sat in a giant compost pile. “Oh please sir-worm don’t do me no harm.” Ephram said. The worm coughed up a spot of fresh soil and said, well he didn’t actually say it with his mouth, it was more like pictures appeared in Ephram’s head. The worm seemed to be speaking to him in vibrations. No sounds but yet there were sounds, no words but there were words. It was a vibratory story. Trees hold secrets. And these trees held secrets. They were Two-Tongued Trees. Under the ground most trees have roots, but these trees had two giant tongues that lapped up water and nutrients from the earth. You see the soil has everything the trees need. You can’t see the tongues because they are underground; but once, when Grampa Fomp had to cut down a dead tree for firewood, Ephram saw them. “Ephram come here son, take a look at dem two tongues on dis Two Tongued Tree, see there?” Of course the tongues were all dried out by then, but there they were and so, so strange. You could tell that it was a Two Tongued Tree because the bark was different and the pine needles had 5 and a half needles in a bundle (5 long needles and one short one) this was definitely a Two Tongued Trees. It held secrets. Ephram could just feel it. Ephram went to touch one of the tongues and even though the tongue was dried out, Ephram could still feel the tongue suckling on his hand a little. “Careful now boy!” Said Grampa “Oh My” whispered Ephram. The sandals walked Ephram on through the woods. In the distance a Medicine Owl called. The sound echoed through the trees like a ping- pong ball bouncing back and forth. Medicine Owls only call exactly one hour after the sun goes down. “I’m hungry.” Ephram’s belly rumbled in agreement. After looking around Ephram found a ripe seeping butterwort to munch on. Except for the owl everything was so quiet. Ephram could almost feel the two tongues – silently lapping up tree-food. “Where are we going?” Ephram hollered. “I don’t want to die in these woods, those two- tongues will lap me up dry for sure”. But the sandals just kept walking, the soft moss squishing beneath them. By and by and after a -while and awhile, sounds began weaving through the forest. Was it music? The sandals took him towards it. Soon Ephram came upon an old fellow playing the strangest music he had ever heard. The man had a great white beard and leaned up against a giant Two-Tongued Tree. He held an instrument that looked like a guitar but had skin stretched across the top of it. It had a funny smell to it too; like goats. Something in Ephram sort of liked the music as strange as it was. “Excuse me mister but what kind of music is that?” asked Ephram. The old man spoke without looking up. “It’s blues music, special blues music, heh, heh. Sour mashed yummy gummus music in the key of Z. You see the blues in Z minor is not so easy to play, you’ve got to know the notes, they often slip away.” And with that the old man’s fingers moved across the strings to make the most magically strange sounds Ephram had ever felt. Yes felt. He felt the notes in his body. 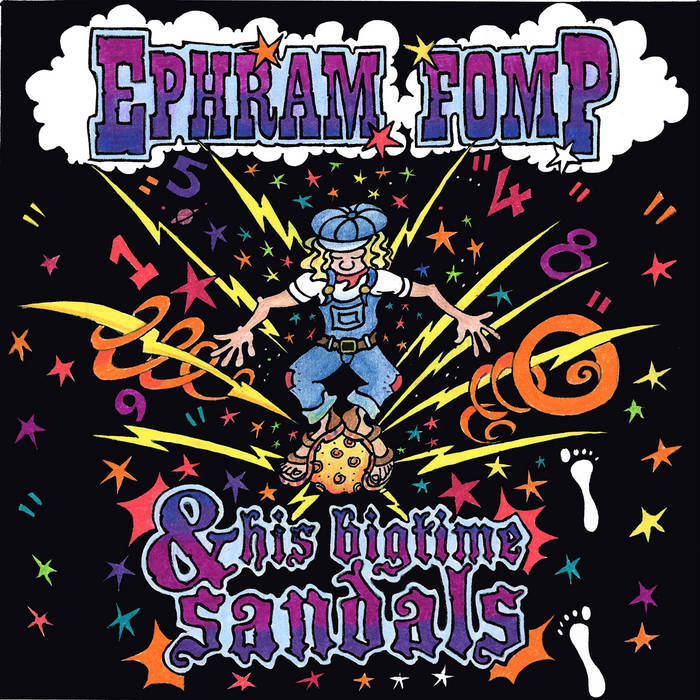 And the sandals moved Ephram’s feet in time with the music. “Ha Hee Mu Muk, Muk Muk!” Ephram giggled as the notes tickled his tummy. Oh, this was yummy. Yummy gummus music. “Now how’d you like to play the blues in Z minor?” asked the old man. “Whaa? But I dont know how,” said Ephram. “Oh sure you do,” replied the bluesman. “It don’t matter what notes you play, or what scales you lay, it don’t matter how you look, or if you get your music out of a sook book! As long as you play and you got somethin’ to say, then hey, lets play it, create it, bake it, rake it, rhyme it, mime it, what time is it in? The notes in-between-the-notes are the best because they make us unique from the rest. The moles hold down the wholes and a calf will cover the halves. A Baboon playin’ a bassoon can play a tune that comes from the moon. It don’t matter what you play, just play, all day. So you see the blues in Z minor is easy to play, but you got to know the notes, they often slip away. Come on now, play a jiggle wif me!” “I, I, don’t know I don’t really know how to play music but I do like the blues in Z minor” said Ephram. “ Oh sure you do,” said the old man. And with that he handed him an out of tune bassoon and together they began to croon. OOOOOMM! Honk! Honk! OOOOOM! They played music that no one had ever heard before….. Suddenly the big time sandals lurched forward and Ephram almost fell over from the movement. The bassoon fell to the ground. “Hey, hey! Wait just a minute! Hey, hey! Where ya goin’ sandals? We were just getting started! I was learning to play basson!” cried Ephram. The sandals force-walked him back into the woods. The blues in Z minor echoed in the distance as the old man just kept on playing by himself. “I wasn’t done yet, where are we going now?” sighed Ephram. “These sandals seem to have a mind of their own. I wonder if I can talk to them?” thought Ephram. “Hey sandals! Stop right here!” The sandals just squished along the moss and thick duff of the forest floor. Ephram gave up and let them walk him. Otherwhile, in another part of the forest the Vomus-worm knew something was very wrong. “Ωορμ− Ωηερε_σ μψ σανδαλσ?” (“Worm where’s my sandals?”), the voice asked. As the sandals walked Ephram through the forest he thought about his family. About now they would be gathering for supper and his mother would be calling him. “I don’t wanna sleep in these woods alone” Ephram said out loud. Ephram glanced down at his big time feet. “I shoulda just left these sandals! I could be home eatin’ nardles and pookus mash! Big feet jus get me into trouble!” But Ephram wondered whose sandals they were because as far as he knew he was the only person that had feet this big. Even when he was born he came out feet first and they thought something was wrong with him. Nah, he just had big feet. Really big feet. That’s all. By and by and after awhile Ephram came upon a strange sight sure enough. In fact he almost bumped into him or… her? “Wo!” said Ephram. The sandals stopped. In front of him stood a person who seemed very sad. The strange thing was that he could see right through this person as if he had X-Ray vision. Inside her Ephram could see bones and organs and inside stuff and there seemed to be colors and pictures floating around. Like paintings on the inside. He or… she was a See Sad- See Through Organ Person, totally transparent. “Oh dear, oh dear, can you help me here? I think something’s wrong here. See these colors in here? See the gray inside me here? “Oh dear”. See this black blob inside here? It brings me a tear,” said the See Sad. “What can I do? Can I help?” asked Ephram most confused. “Do you see what’s wrong with me? You can see what’s wrong with me. You can see inside of me. You can see I’m not happy. See here is my fear. See this grey blob here? Stuck right here,” said the See Sad. And the see sad pointed to a spot near the back of her back. Ephram didn’t know what to think. See Sad moaned more. “ It’s fear, something I won’t go near. It’s stuck here. Oh dear. I have fear. Stuck right here. Near these kidneys here. Why? See here when I was six my older sister Ovil hit me with two sticks. Now everyone I come near just gives me fear. I think your going to hit me with two sticks! I fear I can’t go near. oh dear, oh dear, oh dear. ,ohhhgggggg!” Ephram looked at the See Sad See Through Organ Person very carefully. He could see that inside the grey blob was a memory picture of a young See Sad being hit by the older sister Ovil with two sticks. Ephram realized that the memory of Ovil hitting her with two sticks was still stuck in her and was playing over and over again like a stuck movie projector. Ephram had an idea… “Why don’t you pretend Ovil’s here right now and break those sticks in two and tell her to don’t ever hurt you again or your going put beetles in her ear when she’s sleeping!” stated Ephram. “Ohhh do you think I could? Do you think I should? I’m scared, very scared. It’s the fear I can’t go near! Oh dear” said See Sad. “Might as well try. You have nothing to lose,” said Ephram. The See-Sad paused and looked at Ephram carefully. See-Sad could see he looked like a normal boy, then she saw his sandals and his huge feet. “Oh dear, oh dear don’t you have fear? Your feet are rather queer.” Ephram just shrugged his shoulders. “ Why everybody has something funny goin’ on.” “You have no fear? My fear is nothing compared to your queer feet. Oh dear, ohhhh ddearrr!” See-sad paused for a moment as thought colors streamed out from her head... Suddenly See Sad pushed a nearby small Gompus tree and said “No! Ovil, I don’t care what you do but you’ll not hit me! I’m through! I will break your sticks in two! No! No! No! I’m through with you!” She broke off a small branch as if it was one of the sticks. See-Sad shook the little tree most furiously and suddenly… most definitely, the stuck movie projector of Ovil began to move. The memory picture was changing! And with that the See-Sad See Through Organ Person pranced off to the woods. “Very happy, very happy!” Echoed in the distance.